U2's North American tour is on indefinite hold following singer Bono's emergency back surgery. Bono checked out of a Munich hospital on Tuesday, but won't be recovered in time for the band to resuume its world tour with the North American leg, the band's manager, Paul McGuinness, told Reuters. McGuinness said the 50-year-old singer "feels awful" about the postponed tour. "Clearly this is a serious injury and the recuperation time necessary to rehabilitate Bono is a big problem for the U2 tour and has unfortunately necessitated the postponement of 16 shows in North America," McGuinness said. Fans can still hold out hope that Bono will be back in time to resume the tour in Turin, Italy, on Aug. 6. But the injury also means the band won't be playing Glastonbury, an annual music festival in Great Britain. 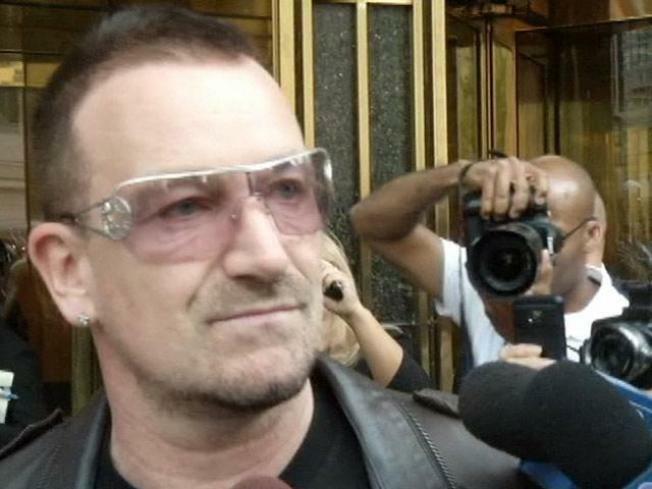 "I'm heartbroken," Bono said in a statement posted on the festival's website. "We really wanted to be there to do something really special — we even wrote a song especially for the festival."